S03xE03 – The mysterious helicopter we saw in the first episode of the series has returned. Or at least I think it’s the same helicopter, but this time it’s in danger. It seems like it’s been shot down, but by who? Andrea and Michonne witness the crash and head toward it to see if there are any survivors, but just as they arrive, so do a group of men. Andrea and Michonne hide out behind some bushes watching as the men check for life and find only one survivor. The other two have died and become walkers, so the men take them out much to the horror of Andrea and Michonne. The men then begin to leave and the girls think they’re in the clear, but not quite. First they have to face good ole Merle. Andrea still sick passes out and next she wakes up in one of the men’s vehicles from the helicopter crash. She’s in and out of consciousness and when she finally comes to she’s in a make-shift hospital with an IV in her arm. Both women are reluctant to stay and would sooner leave rather than later. Merle questions the girls, mainly Andrea because Michonne doesn’t talk. Andrea gives Merle the low down on what happened to the group, and whether Daryl is alive or not. Then the Governor comes in to talk to them. Andrea tells him how appalled she is that they shoved weapons into the heads of those that died in the crash. It’s then that both Governor and Merle realize the girls have no idea about the virus already being inside you. So they get that fun news, and then a small tour of the town they find they are residing in at the moment. It’s night when they get a brief tour and they see that the town is heavily guarded from the walkers, it looks like Andrea is slightly impressed, Michonne, who knows the woman never smiles. It probably doesn’t help that they took her machete/sword away and her pack mule walkers are gone now too. Anyway Governor puts them up in a room for the night with all the fixings of a hot shower and clean clothes. The Governor is next seen entering what looks like a lab, and a doctor fighting with Merle. The doctor was lucky Governor walked in, because I’m pretty sure Merle would have killed him. We see that this doctor has Michonne’s pack mules laid out on tables, and their heads have been hooked up to monitoring wires. We learn that Michonne is pretty dang smart. By cutting off the arms and jaws, you take away their ability to eat, which then suppresses the urge in the walkers. And by her dragging them along, they also acted as a repellent to other walkers, and would explain how they’ve made it as far as they have. The next morning Andrea and Michonne are out for a tour of the town where they find out that there are 72 residents, and a curfew that begins at dark. That would explain the ghost town the night before. Andrea seems to really be intrigued and genuinely interested in staying there, Michonne doesn’t trust them and wants to leave. Governor is visiting the helicopter survivor who happens to be the pilot. He tells Governor that there are more of his men awaiting his return. Governor asks for their location assuring the pilot that he will find them and bring them back to the town where they will be safe. Andrea and Michonne have been invited to tea with the doctor and Governor. There they discuss the possibility that the walkers might still have a part of their old self within them. Andrea doesn’t believe that to be true, nor has she ever thought about it. MIchonne sees that her machete/sword is being housed by the Governor, so her frown grows deeper. And the doctor for some reason reminds me of a young John Ritter. It’s the mannerisms I’m pretty sure. So we are now with the pilot’s other men who are watching the Governor drive up to them waving a white flag. He tells them of how he has their pilot and he’s alive, and then proceeds to shoot the men with the help of Merle and others hiding in the brush. They then take the men’s artillery into possession and back to town. Governor explains to the townspeople how he went to find the men, but they had already been bitten, so they did what they had to do and brought back their vehicles. 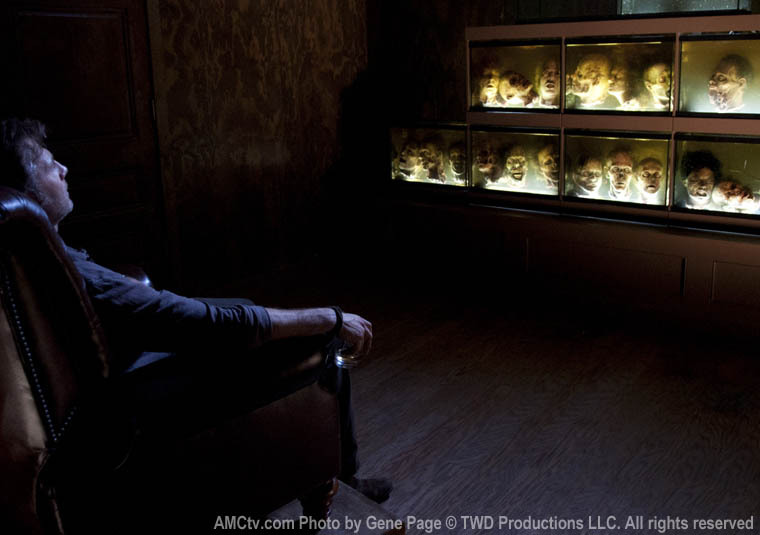 At the end we come upon a glass wall of walker heads encased in I’m assuming formaldehyde, and there on top of the pyramid like wall is the head of the pilot, and sitting staring at all the heads is the Governor. Ew. Best of the episode: Merle returning to cause some more havoc. Should be interesting when he’s reunited with the rest of his wayward group. And is it me or do the casting people really love Brits? David Morrissey is a great casting choice in my opinion. Worst of the episode: Michonne. She seriously bugs big time. And yet I have a feeling she’s going to be around for a while. Where did this episode leave us? 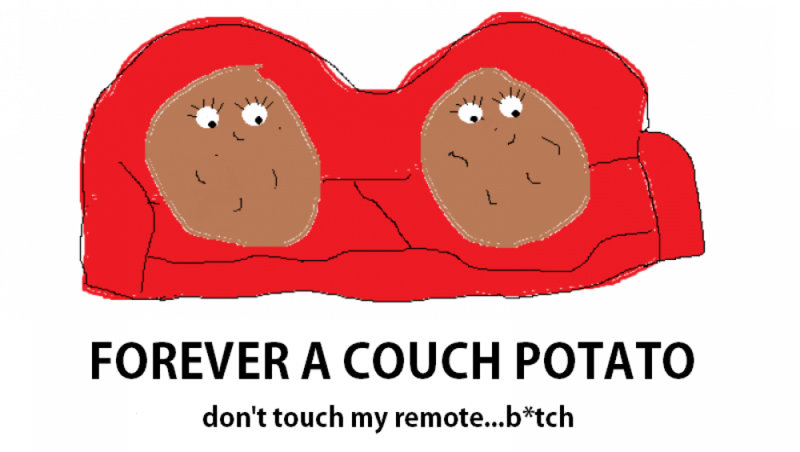 : Knowing that there are worse people out there than the walkers. Or pretty close to equally bad. Rick and the group have a lot of crap coming their way and soon I fear.